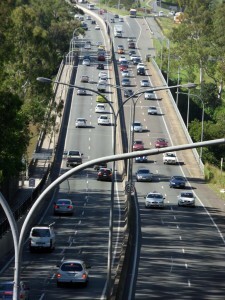 There is a popular saying that circulates in urban planning circles: “Widening roads to solve traffic congestion is like loosening your belt to cure obesity.” Planners have shown over the past few decades that adding lanes to roads, while temporarily increasing flow, does little to address congestion because over time traffic demand continues to climb. To understand it better, we have to understand the basics of traffic. This cycle can be seen all across suburban America. In the Cincinnati area, there are cases where planned road widenings do not even meet future demand. Take for instance the planned expansion of I-75. By 2020, when construction is slated to finish, the level of service for the highway is projected to be exactly the same as it is now. Traffic Engineers explain that this is due to…rising demand from automobile use. It is clear that as long as America continues to spend money on roads, we will continue to facilitate demand for automobiles. Fortunately the same is true with rail transit. 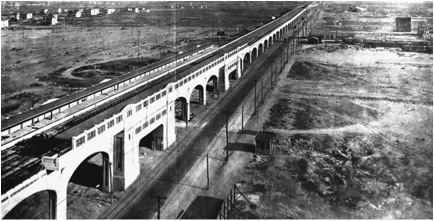 As pointed out by “The Provost of Cincinnati” on the now defunct Phoney Coney blog, we need only to look at the expansion of the New York City subway out to Queens in the 1920’s as one of the many reliable examples where investing in rail transit promoted growth. The same location in Queens in the 1920’s (left) and 1940’s (right). The Washington DC Metro spawned millions of dollars in Transit-Oriented Development from Richmond, VA and all throughout the system. Just recently, a massive $107 million dollar TOD development has broken ground in Northeast Washington DC. The Portland Light Rail and Streetcar lines revitalized the Pearl District, an aging and blighted warehouse neighborhood close to downtown (Sound familiar?). The area has seen over $3.5 billion in development since 2001. The Charlotte Light Rail spawned over a half billion dollars in TOD development along the line. In all cases, ridership has met or exceeded projections. If traffic engineers were applying their same thinking to these systems, they would be calling for expanding these systems further, which is what is happening. The argument is clear, we Americans can choose to waste our money on continuing a lifestyle that has led to increased isolationism, increased obesity and stress, and longer commutes to nowhere — or we can invest in the convenience, sensible and more healthy alternative of rail transportation. John Yung is an Urban Planner and advocate for pedestrian friendly-planning. Currently the Zoning Administrator of the City of Bellevue, KY he specializes in Land Use Planning, Form-based Codes, Floodplain Management and Urban Forestry. John is currently pursuing a Masters Degree from the University of Cincinnati’s School of Planning. If you would like to sound off about something for UrbanCincy’s weekly op-ed column, please submit your ideas to urbancincy@gmail.com.